Today there are people (probably the majority) who are focused on the past: it is not bad faith, but it is a lack of ability to recognize the new. 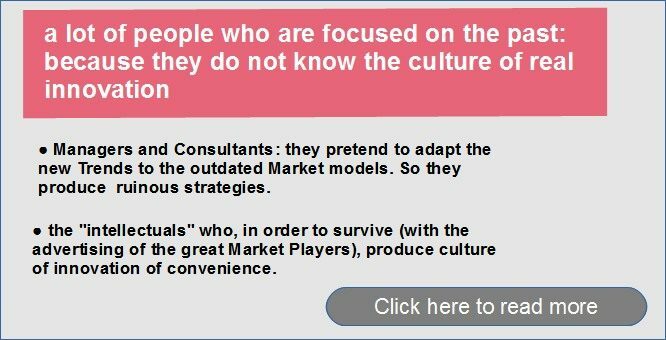 ● Managers and Consultants of the great Market Players: they, equipped with an obsolete Culture, pretend to adapt the new Trends to the outdated Market models. So they fail to meet the real needs of people, they produce ruinous strategies. ● the “intellectuals” who, in order to survive (with the advertising of the great Market Players), produce culture of innovation of convenience. The latter are committed to fighting radical innovation that is slowly weakening the great players, and remain on an ideological level that comes to ignore part of the definition of Disruptive innovation by Clayton Christensen to attack the radical innovation that was already developing on the market at the time (see Jill Lepore’s article Jill Lepore “The Disruption Machine” – NewYorker, June 23, 2014).